The drier my skin got, the more irritated it became and washing my face was particularly painful. This smooth cleanser with coconut and murumuru seed butter helps protect the skin’s lipid barrier. Afterwards my skin felt calm and refreshed. 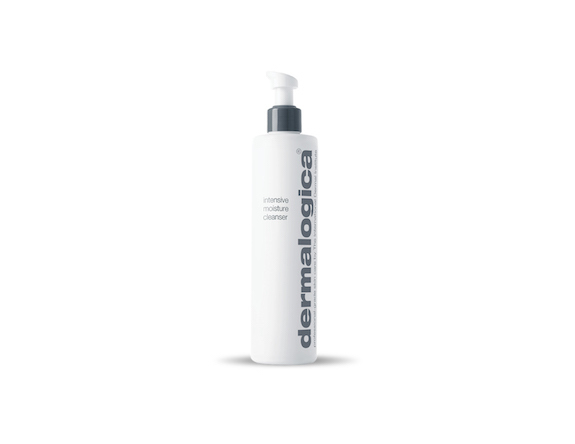 Dermalogica Intensive Moisture Cleanser, $56 at Dermalogica spas and Sephora. I couldn’t bear to exfoliate my raw and flaky skin, but I needed to ditch the dead stuff so I looked for a super gentle exfoliator. This Consonant Maximum Glycolic Meta Serum gave me a hit of exfoliation and hydration in one, without rubbing. Used nightly the 10 % glycolic acid dissolves the bonds that hold the dead skin cells, gradually revealing new, glowy skin. Consonant Maximum Glycolic Meta Serum, $60 at Consonant Skincare stores and consonantskincare.com. My biggest obstacle to leaving the house was the dry, cracking skin from my lip to my nose. That’s where the Healing Eczema Balm from Province Apothecary came to the rescue. The thick zinc formula acted like a barrier preventing further dehydration while oatmeal and anti-inflammatory calendula calmed my angry skin. It felt especially soothing under the brands cooling jade roller. Province Apothecary Healing Eczema Balm, $52, at Province Apothecary stores and provinceapothecary.ca. I was nervous about stripping my irritated skin when removing makeup but Bioderma’s Sensibio H20 Anti-Redness Make-Up Removing Micelle Solution lived up to its name. The formula’s fatty acid esters are similar to the lipids in the skin and help to rebuild it. I gently dabbed the saturated cotton pads onto my face and without dragging it removed all trace of makeup and the red pigment in my cheeks disappeared too. Bioderma Laboratoire Dermatologique Sensibio H20, $20 at Shoppers Drug Mart. The last piece of my armed defence against cold-ravaged skin is Bite Beauty’s Agave Lip Mask. This bandage of a lip treatment has a nourishing stay-put texture that allows the moisturizing properties of jojoba oil and softening agave to penetrate the skin, while lanolin and beeswax create a barrier preventing further moisture loss, all night long. Bite Beauty Agave Lip Mask, $20 at Bite Beauty and Sephora. CBA 2019: Get Your Tickets Now!